Learning From Our Past To Fight For Our Future:	The 1952 Asian and Pacific Peace Conference | Fight Back! Berkeley, CA - In October of 1952, more than 400 delegates and observers from 37 countries gathered in Beijing, China for the Peace Conference of the Asian and Pacific Regions. 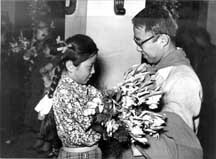 Two of the delegates from the United States were Mary Bonzo and Lewis Suzuki. In the 50 years since the conference, both Mary and Lewis have remained active fighters for peace and supporters of national liberation movements. In August, both spoke at a program to commemorate the anniversary of the atomic bombings of Hiroshima and Nagasaki. The program was sponsored by Nosei, a group of younger Japanese American activists in San Francisco and the East Bay. I spoke with Mary and Lewis after the program. Naomi: The Peace Conference was held just three years after the founding of the People's Republic of China. What were your impressions of socialist China? Mary: I found a co-American delegate who could read and write Chinese. Because of his skills, we wandered around in Peking. He was able to ask people what was going on as they gathered around a policeman. The people were arguing with the policeman about some of his behavior. They kept calling him 'comrade.' This amazed me, since I had been picked up several times and threatened by police in the U.S. No argument allowed. Madam Sun Yet Sun [Soong Ching Ling, who chaired the Peace Conference] took the lead in organizing the women. Women were meeting everywhere. They were learning to read along with their children. They were earning the same as the men in the family. They accused their tormentors of the crimes they had committed against them. They had joined the Red Army and fought as well as males. "We have stood up," they said proudly to us. Naomi: How did the Peace Conference address the struggle for peace in Korea in the midst of the Korean War? Mary: Korean delegates were angered by the U.S. use of bacterial and chemical-laden bombs against the people of Korea and northeast China. In North Korea, the U.S. dropped bombs that spread cholera, typhoid, bubonic plague and other infectious diseases from Jan. 28 to March 11 in 1952. The bombs covered an area of six provinces and twenty cities. The Association of Democratic Lawyers, the International Scientific Commission and leading friends of peace documented accurate evidence as to the use of germ warfare by the U.S. forces. Because the news was spread abroad, germ bombing stopped. The next U.S. tactic was saturation bombing of North Korean cities. An exhibit of the bombs that carried the germs was organized in Peking. We (the United States) have weapons of mass destruction and have used them. Hiroshima and Nagasaki are well known. Bacteriological weapons used in Korea are less well known. There is also the forgotten use of the Bikini Atoll as U.S. nuclear test sites, and the list can go on. Naomi: After World War II, many countries of the Third World rebelled against their colonial masters. What did you learn about the relationship between national liberation struggles and the movement for peace? Mary: There is no peace without national liberation and national sovereignty. All nations must have the right to develop their own resources. We learned that one can love one's country and defend it as needed; and also criticize and protest its policy when it infringes on another nation. A country's national interests cannot be allowed to infringe on another nation. True peace means a full livelihood, health care, and education for all citizens. This is unavailable to most people in Africa, Asia, and much of Latin America. The people do not own their own resources. Naomi: Would you like to say anything about the struggle for peace today? Lewis: First of all, we (the United States) cannot invade other countries like Iraq just because we don't like their government. We need to respect the sovereignty of other nations. Secondly, we shouldn't be labeling national liberation movements such as the New People's Army of the Philippines as "terrorists" and then send thousands of U.S. troops there under the guise of "fighting terrorism." I am very hopeful for the peace movement in this country. Many of the new immigrant communities and in the environmental movement see the need for peace.